Most of my brain cycles are devoted to either tech/innovation or the dharma, so I was understandably delighted to discover the Buddhist Geeks conference, and even more delighted earlier this year when they asked me to be a speaker. The conference was held in Boulder, Colorado a few weeks ago, and there I met lovely people who are “playing at the intersection of Buddhism, technology, and global culture” and inspired me to do more of the same. What we call Buddhism has often been a radical experiment in understanding the nature of human suffering and exploring ways to alleviate it, as well as exploring deep potentials of the human mind and heart. As we move further into the 21st century — a time marked by unprecedented change — those of us who wish to respond to these changing conditions are forced to look at what it means to innovate, how it works, and what the potential risks and rewards are. At the beginning of the panel we each presented for a few minutes. 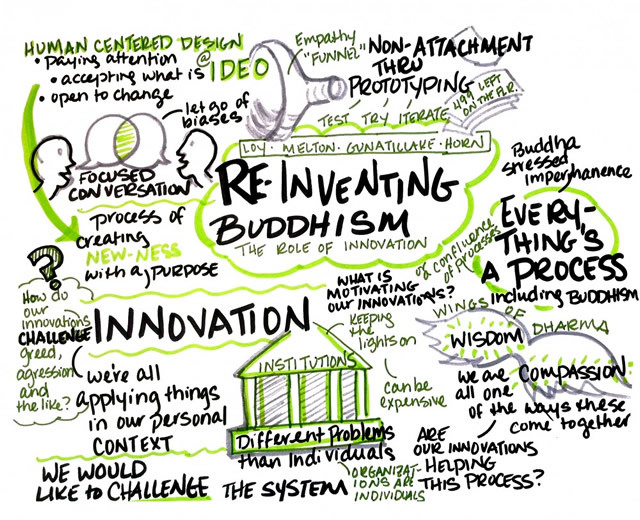 For my part, I spoke about innovation as a process, and how core principles of the human-centered design process align in interesting ways with what dharma practitioners do. This process of being fully present, accepting what is, and connecting through compassion is at the heart of what dharma practice is all about — and it’s also at the core of the human-centered design process. I also talked the part of the HCD process where the team moves from insight and synthesis to prototyping. During the prototyping phase, we deliberately foster a spirit of non-attachment through going broad with a large number of initial sketches and low fidelity prototypes. (Too often, designers get a hunch for something and get attached to one design solution without exploring the range of possible options.) As the prototyping process continues, we winnow down the possible options and bring them into higher fidelity forms, so at the end we might have only one design expression — but it will be the right one. Along the way we will have lost possibly hundreds of other directions. This is great training for another core dharma principle, the impermanence of all phenomena. 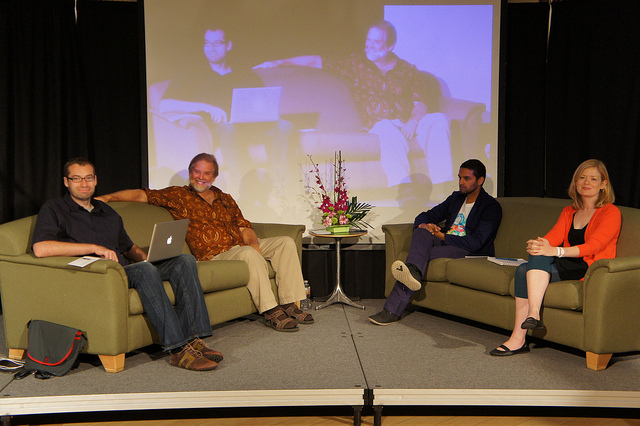 My favorite moment of the conversation was when Vince brought up how idealism and cynicism both prevent real innovation. He noted that idealism blocks us from being able to accept the world as it is and situations as they are, for example insisting that we want for organizations to be non-hierarchical despite that not working terribly well. He remarked that we should move from this idealism to a place where we can make decisions for our current reality. And on the other hand, that we should not fall victim to a cynical perspective that the systems are broken and we’re “all basically going down with the Titanic together.” Being stuck in this space keeps us from taking action or accepting responsibility. I’m looking forward to returning next year. If you are at all dharma curious I highly recommend it. Stumbled across your site looking for for zen garden photos for my desktop, which allowed me to browse terrariums and voila!, here I landed. Being a geek and a zen o’phile I found it a great place to spend a few minutes reading. Thank you!